Weddings are by far the most flower-oriented events in the world. Here are all the types of flowers that people like to have at a wedding. Luckily, only about half of these are actually “required”. 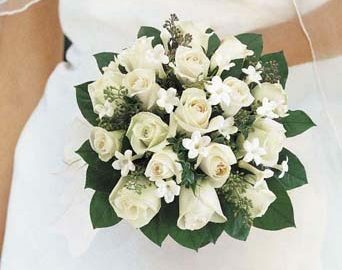 Bridal bouquet– This is exactly what it sounds like, the bouquet that the bride has. It is always the biggest and best bouquet out of all the rest. Maid of honor’s and bridesmaids’ bouquets– These are bouquets for the women in the wedding party. They can either be miniatures of the bridal bouquets, or a completely different style and/or color. Boutonnieres for the groom, best man, dads, and grandfathers– Boutonnieres are very important so that your guests can distinguish who is part of the bridal party/ immediate family. Generally, the groom’s is bigger and/or more elaborate. Corsages for moms and grandmothers– Corsages are bigger boutonnieres that are worn on the wrist. They are also good for distinguishing immediate family. Flowers to decorate the ceremony venue– (Optional) Often ceremony sites will not need very many decorations, but if you choose to do so, you may be able to reuse them at the reception hall as well, which will help your budget. Flower girl’s basket of petals– Everyone knows that the flower girl needs petals to sprinkle on the ground; just make sure the basket is proportionate to your flower girl. Reception table centerpieces– (Optional) Most centerpieces are made with flowers. However, it is becoming increasingly popular to use other items instead to save money. Other reception flowers (place settings, doorways, etc. )– (Optional) Many brides choose to decorate their reception hall with either flowers or ribbon/tulle. If you choose a good reception hall, they may have it decorated already. Flower-covered arch or huppah– (Optional) Arches an huppahs can be left plain, or decorated with flowers for a more festive look. Floral wreaths for bride’s and/or bridesmaids’ hair– (Optional) Some brides choose to have their bridesmaids wear floral wreaths instead of having bouquets. You could also choose to have both if you wanted a very floral wedding. Rose petals for tossing– (Optional) There are so many different things to throw now that petals are not very common. If you do choose to use them, 150 guests require 10 bags. Tossing bouquet– (Optional) This bouquet is optional for the one reason that is that some brides choose to throw their original bouquet. If you want to keep yours, you’ll need to get a tossing bouquet. Extras (such as row decorations) – (Optional) As mentioned above, many ceremony and reception sites will already have decorations, or a decorative feeling (a garden location), so extra decorations are usually not necessary.